John Grisham talks with Bill Moyers about writers and writing  from the teacher who inspired his love of reading to the mandatory homage a Mississippi native pays to Faulkner. 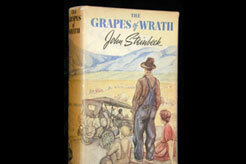 Among Grisham's all-time favorites  John Steinbeck's tale of struggle THE GRAPES OF WRATH. Steinbeck, once a staple of school systems everywhere is undergoing a reading renaissance. Grisham himself plans to read all Steinbeck's works in 2008. Grisham's works now figure high on lists of all-time great suspense along with another of his idols, John Le Carré. Find out more about the authors from the links below. On October 11, 2007, Doris Lessing became the oldest person to win the Nobel Prize. In 2003, Bill Moyers talked with Lessing about life, politics and the process of writing. Bill Moyers interviews John Grisham, best-selling author of THE FIRM, THE PELICAN BRIEF, and THE RAINMAKER, in a far-ranging conversation that gives viewers insight into the beliefs and background that influenced Grisham�s work and provides an unexpected look at his views about the state of the nation. Sociologist Katharine Newman on the global markets' effect on kitchen table issues.